Crime and public safety is a tricky issue. Simply throwing more police is not always the solution, just as adding additional social service programs doesn’t always do the trick. What is generally accepted though is that economics tend to drive criminal behavior. A “study” that came out yesterday reported that Cincinnati’s historic Over-the-Rhine is the most dangerous neighborhood in the country. That’s right, the most dangerous. Besides not even passing the smell test, this study fails in several regards: outdated data, selective boundary drawing and lack of human understanding of reality. Here’s the problem with their analysis. In 2007 the crime statistics for Over-the-Rhine (full neighborhood) registered a total of 390 violent crimes. So if all of Over-the-Rhine had 390 violent crimes in 2007, why would they project 457 violent crimes in 1/4th of the neighborhood? The report is based on the FBI’s Unified Crime Reports. If you take a brief second or two out of your life you can read the clear warning on their site regarding the use of this data for comparison purposes. “Each year when Crime in the United States is published, some entities use reported figures to compile rankings of cities and counties. These rough rankings provide no insight into the numerous variables that mold crime in a particular town, city, county, state, or region. Consequently, they lead to simplistic and/or incomplete analyses that often create misleading perceptions adversely affecting communities and their residents. Valid assessments are possible only with careful study and analysis of the range of unique conditions affecting each local law enforcement jurisdiction. The Cincinnati Center City Development Corporation (3CDC) is a group of local corporations in Cincinnati that have worked towards redeveloping Cincinnati’s center city into a vibrant, safe and livable area that is appealing to a diverse collection of people including the talent they are attempting to attract to Cincinnati. 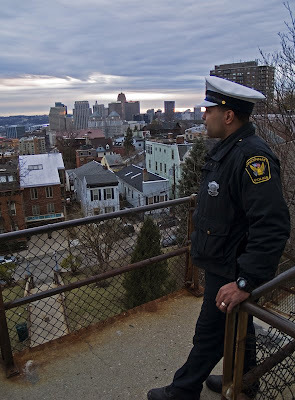 3CDC’s Kelly Leon also stated that she spoke with Lt. Mark Briede from the Cincinnati Police Department today, and he informed her that crime stats for January-May 2009 compared to January-May 2005 indicates a 36% drop in violent crime in Over-the-Rhine. This is important, because the study that was released only examined data from 2005 to 2007 and ignored the most recent crime data available to the public. 3CDC has been intimately involved in Over-the-Rhine for several years now working on the area in Over-the-Rhine known as the Gateway Quarter where almost $100 million of private investment has occurred and resulted in hundreds of new residential units and dozens of new businesses. Below you can see the statement released by 3CDC in response to what they consider to be an “intellectually dishonest” report. Feeling safe in an area is often a subjective item. One person may feel more comfortable in an area than someone else. If I feel comfortable walking around Findlay Market’s nearby streets (which I do) and someone else does not, then who is right? If you have never been to a place then how can you reasonably make an assumption on its safety as you would perceive it. I have often given tours to out-of-towners visiting Cincinnati and considering a move into a Downtown or Over-the-Rhine dwelling unit. Instead of telling them if the neighborhood is safe or not I take them for a walk through the neighborhood and let them decide for themselves. Often times after they see the single women, children playing outside and individuals walking dogs they get the feeling that the hype isn’t always true. Ronny Salerno did a great write up of his own on this very topic. He examined the study’s findings and compared them to his personal experiences of doing “ride-alongs” with District 1 police officers that patrol Over-the-Rhine. Ronny also goes on to discuss his observations, of the neighborhood, from his exploration of the neighborhood’s architecture, abandoned buildings and newly renovated structures. Personal knowledge and experience seems to trump all, and those that know Over-the-Rhine know that this report is not only outdated, but it is flat out wrong and illustrates lazy research that is distanced from reality. *UrbanCincy originally reported that Over-the-Rhine’s population was 7,638 with a violent crime rate of 51.6. In fact, Over-the-Rhine’s actual population is 6,497 resulting in a violent crime rate of 60.02. The error occurred due to the inclusion of Census Tract 11 which includes the Pendleton neighborhood immediately adjacent to Over-the-Rhine.